I like big crowns and I cannot lie. No flat top muffins need apply. It up if it’s not high. Sorry for the rap (and thank you Sir Mix A Lot), but muffins with nice tops make me really happy; especially when they’re experimental muffins that I was pretty sure would end up in ye olde trash can. The tops did crack, but they were still tall and had a good crustiness encasing what I thought was an appropriately moist interior thanks to the chocolate chips. Here’s the recipe. I’ve only made these once, but I feel like they’re good enough to post as is. Besides, if they don’t work out you haven’t wasted much. I actually halved this recipe and made 3 muffins, but normal people would probably want to make at least 6. Speaking of normal, you probably don’t spend hot summer days making apple butter, but I do, and I use the crock pot so it’s not as crazy as it sounds and the holiday smell makes you forget it’s 106 outside. If you end up trying these with applesauce, let me know how it goes. I’m not sure applesauce would be as good, but sometimes you just have to use what’s around. As I type this, I’m thinking prune baby food would be an interesting stand-in or even apple baby food, which is smoother than applesauce. This comment is in reply to Joan who added a full cup of yogurt to the recipe and said the muffins were moist but had a sour taste. Yes, yogurt could very well do that. Did you ever get that muffin top pan from williams sonoma? It’s a muffin pan with 2 levels of muffin tops so you get a thick, overhang muffin top everytime. it’s fabulous! Made these this morning. They were very good, though I think I overcooked mine slightly so they were a tad dry. The apple butter taste was definitely “present” but was completely in the background…in a good way. Thanks for sharing this recipe, and others! Perfect timing Anna! I was just thinking of what I could make with my apple butter besides apple cake. Laura, Quaker Oats has an oatmeal cookie recipe that looks good. Thanks for the feedback! I actually bought (gasp!) a lot of apple butter last fall for a recipe. I have a huge jar of it left and would love to use it up, as I really don’t do anything with it normally and haven’t found a lot of recipes that I’ve been interested in trying that incorporate it. I’ll definitely give these muffins a spin. Thanks again! Sue, thanks for trying it. I think the moisture and the pectin in the apple butter probably helped mine, but it’s good to know that bananas are still a good option. Laura, I used it to knock out fat and add a little flavor. The flavor combo of apples and chocolate sounds weird, but it’s actually pretty good in some recipes. In this case, the apple is just kind of a background flavor. Here are two other really good recipes that use chocolate and apple. A couple more things… they’re tall and they smell great!!! I’ll post photos on my blog soon. These turned out really great for me! It will be weeks before I can get apple butter made and I wanted to make these today so I used an over ripe banana. I used enough banana to weigh 114 g. Now this is a major ingredient substitution. I’m thinking that apple butter probably has more moisture and more sugar than banana does. Not to mention the pectin that would be in the apples. Being a bit worried about the different moisture level I added 1/2 T. almond milk. I also added a little more cinnamon, and a pinch of cloves and allspice to make up for the missing spices in the apple butter. I will look forward to making them exactly as written when apple season rolls around. In the meantime these worked out well for me and weren’t dry. All in all they’re a pretty healthy treat. Thanks Anna! Sorry for the stupid question but was the apple butter mainly used as a flavor-less fat substitute, or did you actually get an apple taste as a result. I’m hoping for the former. Thanks! Oh, and nice touch with the chocolate chips–I keep seeing that today is National Chocolate Chip Day, which I thought was back in May. That must have been chocolate chip cookie day. Now that song is stuck in my head! I love making homemade apple butter. Last year I made peach butter, too. I like big crowns on muffins, too–that’s how muffins should be. Great rap! I love muffin with a high top too! Haha I am pretty sure you are the first person to wrap about healthy muffins. Kanye should take hints from you! Okay, good. Sounds like yours were the same as mine. Hi – I did weigh the flour and used KA white whole wheat as well. I agree that you need to have chocolate chips to add moistness and sweetness. Next time I want to try pumpkin. Yum! These look so lovely, Anna! I haven’t made muffins in months, it’s a shame. I’m with you on the big tops – and the rap is adorable. And adding cocoa to any recipe can only help!! Katherine, thanks so much for trying them! I thought they were really good and that the moistness level was okay with the chocolate chips. I think they do need those to balance it. Thanks for trying it with banana. Did you weigh your flour? Maybe you used a little more than I did. I used King Arthur white whole wheat. Gloria, I’m definitely going to try these again with prune since a) it’s got lots of fiber b) goes well with chocolate and spices and c) is a binder. I didn’t add any nuts, but I did sprinkle those little miniature chocolate chips on top. Sue, with these I tried to use even less oil than in the pumpkin version. As luck would have it, I had two egg whites from a cake I made yesterday… so I felt compelled to make these. Instead of using apple butter I used a smashed banana. It was an interesting flavor combination, especially with the hint of cinnamon. Mine were done in 19 minutes and they had a nice high crown as well. 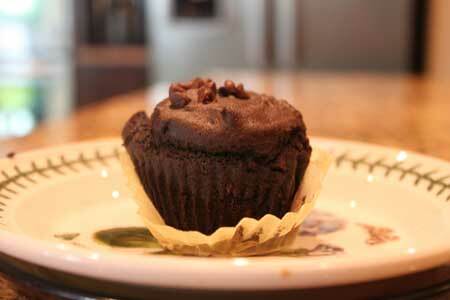 Not the moistest muffin, but really good for a healthy treat. These look good AND healthy! Did you add pecans on top before baking? I like the idea of baby food prunes for these muffins…they are tasty! I ate a lot of baby food fruit, veggies, and yes, the yucky meat a year ago after thyroid surgery. I liked all the fruit and baby food has no additives. Adam, that’s a great idea. And reduced sweetened applesauce might work just as well, since apple butter is much sweeter than apple sauce. I love the the idea of an apple chocolate muffin. I made some chocolate muffins with apple sauce (instead of butter) a few weekends ago that I have yet to post about, but they were nothing special. Apple butter on the other hand would likely have given them a bit more richness, which they needed. I’m assuming I could just reduce some unsweetened apple sauce until it’s thick to get a fast apple butter?